There’s a Robert Warshow quote that Roger Ebert likes to flog from time to time on his blog and elsewhere, and it runs like this: “A man goes to the movies. The critic must be honest enough to admit that he is that man.” As such it must be said that the greatest difficulty in assessing Gus Van Sant’s Milk, an unusually sober and vibrant biopic with elements borrowed from the realm of docudrama, is its accidental relevance in the wake of California’s recent Prop 8 vote to ban gay marriages in that state. While it’s true that Prop 8 isn’t as obviously destructive a force as Prop 6, the ballot initiative Harvey Milk rallied against that would have enabled school boards to fire gay and lesbian teachers (reopening the doors for open and unabashed discrimination on the grounds of sexuality), but the recent vote is a reminder that social conservatism is still a massive obstacle in the way of equal rights. With that in mind, it would take a crueler cynic than I to deny the bitter resonance of Milk‘s many scenes of disappointment, anger and ultimately mourning on the part of California’s gay community, especially when their representative, the film’s titular figurehead, has been brought to such vivid life. 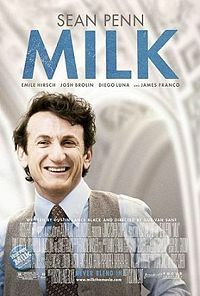 Sean Penn successfully inhabits the role of Milk, the first openly gay elected public official in US history, by exhibiting qualities he rarely gets to accentuate in his roles: charm, joie de vivre, and natural magnetism. Van Sant has often worked in forms both traditional and non-traditional, but for Milk he allows his lead to be a larger-than-life force, something there has never been room for in his intimate portraits of doomed youngsters and lucid dreamers. Penn’s Milk is a man of action and force, characteristics which run against Van Sant’s usual preference for stasis and detachment. Penn fills up the screen whenever he’s present, which accounts for at least 90% of the film. That’s not to discount the thoroughly excellent supporting cast, including James Franco as longtime partner Scott Smith, Emile Hirsch as reluctant lead organizer Cleve Jones, and Diego Luna (Y Tu Mama Tambien, Criminal) as Jack Lira, whose arc serves to exhibit the private pain that often lurks behind history’s stories of triumph. The supporting role that will likely attract moviegoers, however, belongs to Josh Brolin, who essays Dan White, the city supervisor who murdered Milk along with San Francisco mayor Dan Moscombe. Brolin and Van Sant resist the urge to delve into a heady psychological examination of White, and the film is better off for it. While a lesser film would have painted White as a seething homophobe and spent its energy demonstrating it, Brolin plays White simply as a frustrated loner who finds himself trapped as a perennial political loser when he fails to support the gay community, and ultimately lashes out tragically. Milk occupies a strange place in Van Sant’s already tumultuous filmography; it’s not his only hot-button issue film (see Elephant) but it is his only big-ticket biopic. He does find ways to spice up the formula, however, and most of them work. A credits montage that displays the true faces of the film’s subjects is effective, and the frequent use of stock footage – particularly interview snippets with staunch anti-gay singer Anita Bryant – are stylishly integrated. The film’s structure is artfully considered as well, with Milk’s death telegraphed within the opening minutes through a news segment, helping to undercut any maudlin aspects the film’s finale might have had with a healthy undercurrent of dread. Van Sant may be dipping his foot in familiar territory, but he’s determined to leave a peculiar mark nonetheless. Milk is a film that many (myself included) will find almost unbearably touching due to its sadly serendipitous timing – but it’s the film’s clarity of craft that will ensure its staying power.